I Rode My Bike Naked Yesterday! Yesterday morning I put my cyclocross bike into the back of my Jeep and headed out to my favorite off-road bike trail. After I got the bike out I put my helmet on but I couldn’t get it buckled—so I took it off and noticed that one piece of the buckle was missing! I started to drive back home to get a different helmet (I have more than a few of them), but finally decided to just “ride safely” and pray I didn’t hit an oak tree at 30 MPH. Riding without a helmet made me feel like I was riding naked—or at least a lot more exposed than I’d like to be. The funny thing is that the day before I saw a graphic on Facebook that said, “Deciding to ride your bike without a helmet is a beacon of hope for those in need of new organs.” The graphic on Facebook was rather pixelated, so I decided to create a new one for your enjoyment. Remember To Fill Out An Organ Donation Card! Yesterday was only the second time in the past twelve years that I rode without a helmet. Last year I started to go for a ride with a young woman when the heat index was already over 110 degrees Fahrenheit (43 Celsius) at 6:00 in the morning. The woman said she was not going to wear her helmet because it was just too hot, so I decided I wouldn’t wear mine either. My wife said it was OK to go without my helmet because we were both probably going to die from heat stroke anyway! Well, we survived the ride but we both ended up riding slower than normal (and not just because of the heat). One of the reasons I don’t like riding without a helmet is because a 17 years ago our middle son nearly died in a bike crash. Even though he knew he wasn’t ever supposed to ride without a helmet he didn’t put one on because he was only going a few houses down the street. Unfortunately, just two houses away he hit a rock in and fell off the back of his bike and his head hit the pavement. I’ll spare you the details, but he suffered from multiple skull fractures and had to be airlifted to a trauma unit in Milwaukee, Wisconsin. He eventually made a near-perfect recovery, but the surgeon who worked on him said he would have trouble with math for the rest of his life (I guess that means he could work in the Congressional Budget Office). As a result of his accident I just don’t like to see anyone, child or adult, ride without a helmet. Do you ever ride without a helmet? If so, why on earth would you do that? I can’t imagine there are enough bike related injuries to make that comparison. is data collected that notes whether a helmet was worn? Is there more or less off road cycling? Standard of driving different? Are non head injury statistics skewed in the same way? You can draw conclusions from anything, but only good quality analysis of figures and contributory factors can tell if your assertion is correct or not. What percentage were directly attributed to head injuries that a helmet is proven would have prevented that severity of injury? It isn’t just bicycles, there are ski accidents, roller blading, skate boarding and motorcycle head injuries. All created by the lack of helmets or improper use of helmets. Believe they track the injuries and how they occur. Statistic are not going to protect your brain.Bottom line is, why wouldn’t you wear a helmet. Protect your brain. As I told someone else, I am not so much afraid of getting killed as much as I am scared of being a vegetable for the rest of my life. Helmet use must be considered separate for each activity, since the contributory factors differ for each. Pedestrians need to protect themselves in full body armour…. Etc. Small cars are less safe and you should drive a tank…. Etc. Belief in helmets wont protect your brain either (that’s my belief). I want more cyclists, some people don’t like wearing helmets, let’s encourage them to the sport rather than scare tactics about brain injuries. The facts I care about are that heart attacks kill and more cycling would reduce those deaths by more than lack of head protection would kill. Out of the cyclist deaths I’ve read about recently, a helmet was not a contributing factor. I’ve not heard of any that say it was because they weren’t wearing a helmet! I love the phrase, “Live free and live on life support.” I believe people have the right to ride without a helmet — I just wish they didn’t want the rest of us to pay for their hospital bills. Agreed, everyone should have the choice. How about their families who have to take care of them or worse yet live on without them. I think it’s selfish and foolish. So the big question is, are our roads indeed safe enough to ride helmet free? Considering that helmets are designed to mitigate the impact from a 12mph impact (approx. ), I don’t think they’ll do much to help with traffic related accidents. You statistics are consistent with the other studies I’ve read. I generally wear a helmet when mountain biking and racing because I know I’m taking more risks than “normal” but don’t stress about it either way for casual riding. I’ve only been to the Netherlands once, but it certainly looked like your roads were a LOT friendlier for cyclists than roads in the United States! Most of us have to ride on roads that were never intended to accommodate both cyclists and motorists at the same time. I know what you mean by feeling naked. A couple of weeks ago I put my bike in the truck and rode with my wife to her work. I then took my bike out to ride the rest of the way to work and discovered I left my helmet at home. I felt vulnerable like I was driving without a seatbelt. I will admit that when I ride with my wife I don’t wear a helmet. This is partly because she refuses to wear one and it would feel awkward for me to wear a helmet if she won’t. It is also because when I ride with her we always take the bike trail where we don’t have to worry about cars. We also don’t ride fast. I know what you mean about not wanting to wear a helmet when the woman doesn’t — that was my case on the other time I rode without a helmet — I won’t do it again. Never never never! My neighbor rides her bike (52 year old woman with a basket on the handlebars) without a helmet. She said it is just in the neighborhood – just like on Cape Cod. I don’t get the comparison – crashes happen anywhere! Statistics (that I don’t know where from right now) show you are more likely to be involved in an accident on roads you and others know… I.e close to home. So her reasoning is the wrong way around! I was expecting a completely different kind of blog post and was all prepared to reminisce in comments about surfing actually naked when I was a teenager in California many years ago and about some unexpected discomfort. When I started riding again as an adult a couple of years ago, I at first never wore a helmet because I’d never had bike helmets growing up. Just wore an old country club sun hat with the brim turned up all around so I’d look groovy in a middle-aged, stodgy way. A neighbor who is a cyclist strongly encouraged me to get and wear a helmet. Now, like you, I feel exposed when riding without it. Glad you found the missing piece. I am not brave enough to ride in the buff — ever, under any circumstances. A sunny Sunday morning about 25 years ago. “You never need to wear a helmet till you really need to” The Actual words he said to to me as we left the car park his helmet swinging on his handle bars. 10 yards into the ride we mounted a small kerb, Nothing to it ‘cept he messed up and headbutted the pavement. We were doing approximately zero mph. Result one cyclist off to emergency with a busted skull……..Wearing his helmet might have saved him a bit of pain, I dunno, you don’t need one till you need one. My helmet wouldn’t protect my forehead, might have pushed the neck further back and caused spinal injures if anything. Exactly! And since you never know when you are going to need it is best to always wear it when riding. Yep, you never know when you might trip down the stairs or in the shower and kill yourself. Which is why we should advocate 24 hour helmet use for everyday activities such as biking, walking and showering. Helmets are for dangerous activities, not for safe activities like biking to the office. If you feel like you must ride like a daredevil, then helmets are certainly indicated as part of the superhero costume. Males are “overly represented” in crashes involving bicycles, motorcycles and cars because we bike and drive too fast and aggressively. Tone down the aggression and speed, and our riding becomes about as safe as driving to the supermarket. I crashed a few months ago on a hike and bike trail. I wasn’t going that fast, but my bike slipped in some mud and I went down right on my head. Fortunately, I had my helmet on and so what could have been a serious head injury wound up being just damaged pride and a mark on the helmet. PS. I love your graphic. I think off road is a different kettle of fish to on road cycling, your likely to get a lorry on your head, not a bike. A helmet is useless against a lorry. Glad you liked the graphic! I’ve slipped in the mud a few times as well — and more often in the snow! Ha! I did a post about riding “naked” before too. But not without my helmet. Without everything else technical. No computer. No music. Nothing but me. Bike. Helmet. And clothes. I would love to ride without a helmet but I don’t dare. I have seen too many bad things happen. My husband tells those who don’t want to wear a helmet to sit on top of their kitchen table. Cross their arms over their chest. And fall head first to the floor. Has he tried this with a helmet on? Does he wear any protection whilst walking down the footpath, standing at a bus stop etc? Lots of people die of head injuries and it’s nothing to do with cycling. Maybe he should always wear his helmet when outside. Can’t say that he has. The point being, a fall to your head in any situation can be dangerous. No one thinks of falling off of their table on to their head. Your point is taken, perhaps wearing a helmet at all times would make one safer. Maybe not. It’s a matter of choice. I’ve gone down and been knocked down often enough to know I benefit from a helmet. Twice being knocked head first to the pavement when my bike was flipped tires up with me still on it. And the cracked helmets were better than cracked skulls. I have one friend who refuses to wear a helmet while on a motorcycle because he doesn’t think it will save him if he is going high speed and slams his head in to anything. But he wears it on his bicycle because he feels it does offer protection. Again, it’s a matter of choice. I love the feel of wind and fresh air blowing through my hair. But I prefer to protect what grey matter I have working for me. But I get the desire to not wear one for many different reasons. I agree it is a matter of choice — and I choose to wear a helmet! I am not scared of getting killed as much as I am of ending up with brain damage (more than I already have). I totally agree with choice, I do not want helmet laws in my country for that reason. But I feel collection of statistics is tricky and I’d rather people were convinced helmets were useless and more people’s life’s were saved through the health benefits of cycling rather than be put off because it is portrayed to be dangerous. I’d prefer people promote cycling health benefits rather than helmets. 😉 So we don’t agree on the helmet thing. But we DO agree on the media thing. 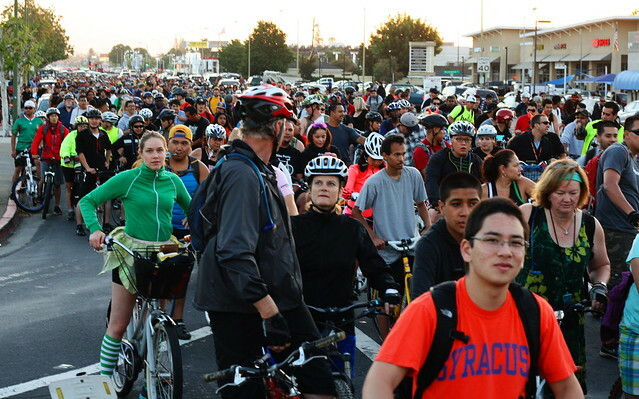 Consider this visual statistic: a recent photo from San Jose Bike Party shows a representative sample of cyclists who participated in this 4,000 strong 25 mile ride. Just eye-balling this I would guess maybe 20% are helmeted. It took 40 minutes for the entire group to pass by where I shot that photo. Now, multiply that by 12 months and eight years. We’ve had two head injuries in that time period. Paradoxically, both head injury cases were wearing helmets, which happens to reinforce my own belief that helmets magnify stupidity. Think about it: you wear a helmet, so you ride less carefully because, after all, you’re protected. Since we’re talking statistics, researchers noticed this tendency for people to compensate for risk ages ago. We put anti-lock brakes and stability control in our cars for “safety,” but the reality is people now drive like idiots because we can get away with it. There’s been no real change in the bicycle fatality and serious injury rate since the 70s (when helmet use was effectively zero) to today (when helmet use is at an estimated 50% in the United States), especially if you compare it to the pedestrian fatality and injury rate (I’ll give you a hint: cyclists fare worse over time than pedestrians, in spite of the increase of available safety equipment for cyclists). It might be worth noting that a noticeable portion of these riders are impaired with alcohol and other drugs in spite of organizer appeals to the contrary. .But I digress. Eight years. Thousands of riders every month. Some ride with helmets, some without. Two head injury cases of note, with both recovered. No vegetables. No life altering injuries. No deaths. And people still believe cycling is a dangerous activity. Hi, I do ride without a helmet. In over 30 years of commuting and recreational cycling (rides 100 mile +) I have never worn one. Maybe I will invest in one as I have no stand point against or for wearing them. I am a tad apprehensive about the prospect of getting to the point where I may feel ‘naked’ without a helmet on. Its like locked doors, seatbelts in cars, swimming in lakes etc-more fear and judgement to deal with…Sod’s law is I’ll have an accident shortly following reading your blog and writing this. I live in the Chicago area and the traffic around here is a nightmare even on a good day — and I would never under any circumstances ride on the road without a helmet. Twice this year I left the house without one. First time I was a mile away. Second time I flat didn’t notice till I was at the turn around point. I bikedMUCH more careful coming back! Does the more carefully part imply you are safer without? NOPE! Just more boring of a ride…. I believe (no stats to back this up) that a cyclist wearing a helmet is more of a risk to themselves than one without. If I didn’t have to worry about cars I MIGHT agree with you… And I grew up riding without a helmet. But nowadays, no way I a, going without it! What I’m trying to say is a cyclist without a helmet may take less risks. Going slower could be deemed safer too – exceptions of course. I am more cautious than I probably should be when I don’t have a helmet — mainly because my son nearly died because he didn’t have his helmet on at the time of the crash. Reblogged this on Biking Bliss. Never! I’m totally fanatical about it. I’m convinced I used up all my good riding-without-a-helmet juju as a kid. I feel kids benefit from head protection because they themselves are their biggest risk, I will encourage my kids to wear them, but they can choose, no laws here and I’m keen to keep it that way. I am just as fanatical — except for the two times I mentioned in the article. Good post – I don’t think I would be here without the benefit of my cycle helmet (or 3) Twice landing badly and once going round a corner that I had cycled a 1000+ times but then the bike slid and my head hit the tarmac and 20 mph + – took a long time before I felt back to near normal. I have been very fortunate so far — I’ve hit the pavement several times but so far the only thing I’ve hurt has been my pride. Good reminder to wear a helmet. I have to confess that I don’t have one though. I’m actually not sure if there’s a right or wrong helmet to buy so that’s been my hesitation. Not a good excuse. Don’t feel bad, cycling without is cooler (sweat and looks wise), if I cycled a mile or two in a city I’d struggle to justify messing up my hair. If you don’t fancy wearing a helmet or spending the money on one, then don’t feel pressured into it. Check what cycling bodies and government recommend, avoid helmet manufacturers etc, then make an informed decision. Great graphic. I’ve accidentally gotten on my bike without a helmet a few times and made it around the block to come back for it, but otherwise I never ride without one. There is enough suffering in the world already — no need to add it by posting photos of me in the buff. As someone else has already observed, most cycling accidents happen close to home — be careful. But the helmet thing … nod nods…it seems so natural to wear one … like seat belts in a car. I would feel awful naked without mine too. In the biking events here, no helmet means no participation as well. Sorry, didn’t make the Naked Bike Ride (nor will I ever). As for the photo, the woman was wearing a blouse under her jacket (honestly, I wouldn’t post an inappropriate photo of a young woman — honest!). I always have to shake my head at the families I see that all the kids are wearing helmets but the parents aren’t. Come on you spend more on lattes in a week than for a helmet. Here I felt spooked yesterday when after a kilometer or so that I forgot to buckle it up, remember it has to be on properly to do the job! They have made informed choices, maybe, anyway, regardless, I’d rather they cycled without than were put off altogether by a helmet law! I’ve suffered only one bike-car collision in my life (I was on the bike), and the only part of my body that touched the car was my head, which bounced off the windshield. I was not wearing a helmet and got away with only a goose-egg and a bruise. I was 12 at the time. I’ve had other spills and wipeouts on the bike since, one of which broke my helmet but left me otherwise only scratched. So I believe in them. However, they are not the last word in bicycle safety and are no guarantee of surviving a wreck. Several cyclists I know who have been grievously injured and a few who were killed while riding their bikes all were wearing helmets. I almost posted your clever graphic to my FB wall, but chose not to because one of my FB friends lost her 12-year-old son several years ago in a bicycle accident in which he was not wearing a helmet (but, they were told, it would have made no difference because his injuries to the rest of his body were so severe). He became an organ donor. She still feels the pain and the loss every day, and I would not dream of posting anything that might appear to mock her or her son’s choices. Helmets are terrific and I think everyone should wear one while riding, even just around the block. So, too, are bicycle safety classes and a strongly defensive riding posture while on the road. A bike helmet is no guarantee that you will survive a crash, but it certainly increases the odds! I am so sorry about your friend’s son — that could have easily been my son when he had his accident. I know many people who have been saved by helmets. The dumbest thing I’ve ever seen were two adults with their kids on “trail-a-bikes” behind them. The kids had helmets, the parents didn’t. What kind of message did they think they were sending? Last year I saw a woman on the bike trail with one of those “trail-a-bikes” and she had a helmet on but her daughter did not! I KINDLY spoke to the woman as I was passing her and asked why the little one did not have a helmet — I can’t repeat what she said in polite company. I felt sorry for the poor kid. That’s crazy. There are some clueless folks out there. I do not wear a helmet, while riding the trainer (HA). Otherwise – I never ride without it. My helmet has saved me. I always wear one. I feel bad about not having one on yesterday because I normally refuse to ride with people who aren’t wearing a helmet. Helmets save lives. In one accident my helmet was cracked from front to back. I was spooked and sore, but my brain was still where it was supposed to be, that is, inside my skull. I am so glad are OK! By the way, I read your “About” page and I don’t imagine you hear “on the left” much anymore! Congratulations! I never used to wear a helmet, until I had my first child. Stupid, but it is what it was, and some days I thank my lucky stars I was very lucky a lot of the time!! Sharp iron ore rocks and heads = quick death!! Anyway, how can one tell a child “you need to wear a helmet,” but you as the adult don’t dawn one??? Hypocritical to say the least!! Our children and myself never ever ride without our buckets, EVER!!! The neighborhood kids can never ride with us unless they have a helmet!! One mother asked my I was being such an A-hole about a helmet. My reply….. I will not be the one to have to come tell you your child has been hurt and may pass on because they didn’t have a helmet on; they can find another adult to ride with, I will not share that horrible news!! It made her think, but her son still has no helmet???!!??? You can lead a horse to water, but you can’t make them drink!! Like I always tell our children, it’s not the fall that harms you……. It’s the sudden and abrupt stop that’ll get ya!! Every 3-5 years we all get new helmets, and then they get to see what a sledge hammer does to a old brittle brain bucket. I never knew helmets expire, I guess I should’ve, but I didn’t!!??!! The “sudden stop” you mentioned in what causes brain damage — you don’t have to even get a drop of blood on the ground to scramble your brain a LOT! Never ever with out a helmet. Our kids aren’t allowed to go down the street without one. It’s like texting and driving. Stupid. A good friend that’s an EMT told me he gets more calls to bike accidents where people don’t have helmets on than anything else – it’s just stupid and dangerous. I live that advertisement! I’ve had two EMTs tell me the same thing (the fire department sends a couple of firemen to my office every year for our annual fire inspection — the stories they tell about kids crashing without helmets will certainly sober you up). I agree, riding without a helmet is like riding naked. I’ve done it on a trail where there were no vehicles and even tho I loved the freedom, I also felt uncomfortable riding without an integral piece of equipment. I take enough risks that I don’t need to add head injury to the list of possibilities. The freedom of riding without a helmet is fun — the three months my son spent in physical therapy after his accident were not. I always wear a helmet, but if I happened to forget it I would still go for a helmetless ride. Due to the various responses you’ll get on such a hot topic, I know that it’s a personal issue whether one decides to ride with or without a helmet. I understand both sides and will not preach one or the other. For me, I will always wear a helmet due to the fact that I’ve fallen many times and whacked my head. Because I wore a helmet, I know I’ve been spared a more serious injury than a simple headache. You are right about it being a personal choice — and I choose to wear one. I don’t care what other cyclists do as long as they don’t want the rest of us to pay for their hospital bills. — I’ve heard people say things like this before, but it’s totally passe, now. Professional cyclists, downhill racers, cross country, race car drivers, motorcyclists, mountain climbers, even trick moto people wear protective head-gear. These people are who kids and some adults aspire to be and look toward as pinnacles of the sport. Saying someone is cool or uncool, or caring about your hair is pretty useless when you are comatose. These people who get paid to do what we do recreationally or for commuting are smart enough to know it’s cool to keep your brain intact. In fact, when I go out on the town on my moto, I’m way cooler tossing my hair about after removing my helmet.. I have been in a motorcycle collision on a major highway, bridge when I hit the upper deck with my jaw of my moto helmet. That would have dislocated my jaw or crushed my face if I didn’t have a helmet on. My helmet proved that. I have also crashed going pretty fast downhill on my mountain bike and into a side fall against a granite cliff. If I didn’t have a helmet on, I would have side impacted my head. I only sustained a large gash in my upper shoulder which needed about 12 stitches, but no big deal: I wasn’t airlifted to safety, just checked into the clinic in town. Saved me $$ and hospital bills in the long run. I don’t believe that everyone killed or injured in a bicycle accident would have been saved by wearing a helmet. You have tons of internal organs and limbs that can be impacted and we are normally trying to protect our heads when we fall, but hell if I’m going to start slurring my words due to a traumatic brain injury just to look cool. Luck does favor the prepared. 😛 I never ride without a helmet. You are SO correct that “Luck does favor the prepared.” I’ve had a few “unplanned dismounts” myself (“crash” is such an ugly word) and have never regretted having a helmet on at time of impact. Absolutely not! My helmet is always on (and I always ride in a car with my seat belt on). There are very few things I can control when I’m out on my bike, so why use the tools I have to control SOME factors…like protecting my brain. You put it extremely well! Control what you can and protect the brain at all costs! I’ve never gone out for a ride without a helmet but admit to riding in front of my house without one after cleaning my bike or to test some adjustment or another. Maybe I need to rethink that. I too have ridden in front of my house without a helmet after working on my bike — then I pass the spot where my son almost died and go back and put the helmet on. Wearing a helmet is always safer than not wearing a helmet. But it depends on where you are riding and what kind of ride it is. According to the Tour de France, the most dangerous part of cycling is when descending and the least dangerous is when climbing (although climbing is the most painful ride of them all). So the only time I think they allow a cyclist in the Tour de France to not wear a helmet is when climbing (usually near the end because they need all the cool air they can get and it is a matter of preference by the individual cyclist). A helmet should be required always especially when descending at high speeds. I believe if Fabio Casartelli was wearing a helmet while descending the Col de Portet d’Aspet in the Pyrenees during the 1995 Tour de France, he may have survived the crash—“Casartelli’s head struck the concrete blocks along the roadway, causing severe head injuries and loss of consciousness.” Now I think every competitor is required to wear a helmet especially when descending a mountain. I know what you mean about feeling like you’re naked without a helmet. I forgot my helmet today and I felt very vulnerable while cycling. A helmet is good to have always. But wearing a helmet should never be required by law, it should always be a matter of choice—To each his own. Dante — I agree with you! I don’t want to FORCE people to wear a helmet (I have government regulations), but I WISH people would be responsible enough to wear one on their own. I wear my helmet religiously no matter how short the ride. About a month ago I was test riding a used bike (Catrike Village Recumbent Trike) and a friend took a photo of me. This one time I was not wearing my helmet and it looked strange to me. Funny, I don’t think there is a of photo of me riding without a helmet anywhere! What people don’t realize about crashing is that the fast racer guys like us usually have “fly and slide” kind of crashes, whereas the slow leisurely recreational cyclists have quick and sharp smacks to the ground. Riding slowly, anywhere, is never a guarantee of safety, and with helmets being light, breathable, and stylish – and inexpensive – there’s never a reason not to wear one! Jason — great point! Even a $20 helmet from Walmart will meet the same safety standards of a $300 helmet (but it won’t be as light). I am so gonna post that in my Instagram crediting you my good man, do I have your permission sir. Love all this post… thank you !! Humorous way to get through to recalcitrant BareHeads! and they showed some scary shots and statistics associated w cyclists, head brain injury and helmet use. Glad you didn’t become a stat out there! Good comments. I wear a helmet most of the time. Depends on what kind of riding I’m doing. I don’t like seatbelt laws or helmet laws. It’s kinda funny I that I can ride down the road on my motorcycle without a helmet, but I can’t drive a car without a seatbelt. I only wear a helmet when I am required to. And oddly enough, the only times I have ever been glad I was wearing a helmet were on a few group rides where one, or both, of two things were happening. Obvious amateur riders (of which I am one myself), riding WAY too close to other riders…. “like the pros do”. This caused quite a a lot of near disasters, and a few minor crashes as well. My rule is that if I can touch you, you’re too close! The other thing was when just starting up, and when stopping at a rest point, riders having a lot of trouble getting into and out of their pedals, and in the process, falling over and taking other riders out with them. I am mainly a solitary rider, and if I ride with other people, it’s never really more than 2 or 3. I am also a little bit ADD when it comes to riding. I’m not focused on my speed, or my cadence, or watts. I’m focusing on looking around me. Noticing all of the obstacles, potential hazards, and not to mention much of the beautiful scenery all around us. I’ve seen plenty of cyclists barreling ahead at break neck speeds, riding right over debris in the road, potholes, etc. And so many time, with their head down, pumping away. I’ve seen this on country roads as much as I have in busy cities. Cyclists are always complaining about motorists. And motorists are always complaining about cyclists. And here is my conclusion. People are idiots. It doesn’t matter if you’re in a car, on a bike, or walking. If you’re an idiot, you’re probably going to be a hazard. If you cut off other cars while driving, blow through red lights on your bike, or just walk out in traffic as a pedestrian. I ride the same way as I drive and walk. With attention, awareness, and caution. That is what I see most lacking in riders. If riding without a helmet were so incredibly dangerous, then how did we make it this far as a species? Instead of letting kids hurt themselves and learn, we just put them in full body protective suits and don’t let them leave the house, for fear of them getting hurt. Do I think helmets are stupid? Absolutely not! Do I think they are a good idea? Yes I do. Do I think they should be mandatory? NO! Why? Because while helmet use is up, and injury/death figures are down, you know what else is? The number of people riding bikes. (Which if you look at it realistically, when less people are doing something that is potentially dangerous, the accident NUMBERS will always go down. But take a look at the percentages for the real story) And one of the big reasons, is mandatory helmet laws. Which begs the question… Are these laws and rules there for safety reasons, or just for the sake of liability?